Every feminist who travels to Milan should visit the Milan Women's Library! We just returned from a trip to Italy and one of the highlights was a visit to the legendary Libreria delle donne di Milano, the Milan Women's Library,which has existed since 1975. 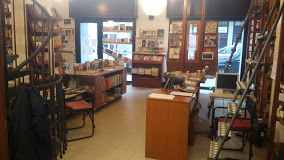 Now located on via Pietro Calvi 29, the non-profit Women's Library is both a bookstore with an impressive stock of feminist books, and a meeting place which hosts meetings, political discussions, and film screenings. 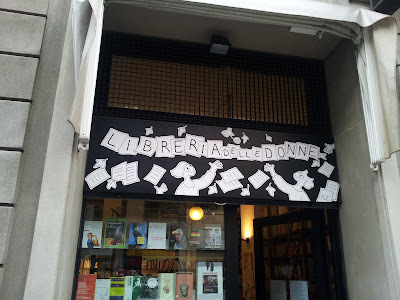 Feminist bookstores have all but disappeared in the United States, but somehow Milanese feminists have managed to keep the Women's Library going on volunteer labor alone. In addition to the well-stocked bookstore/library, there are spacious, inviting meeting rooms. I was impressed both with the Milan Women's Library and with the women I met there. They graciously gave me a tour of the library and meeting rooms as well as a copy of the September 2018 issue of their periodical, SottoSopra. I now have an incentive to work on improving my woefully inadequate reading knowledge of Italian. The website describes the Women's Library as a “feminist enterprise that does not claim parity, but, on the contrary, says that the difference of women is there and we cherish it, we cultivate it…” The feminists who run the Milan Women's Library remain true to what is usually referred to as ”difference feminism", which emphasizes women's difference from men and which has characterized much of Italian feminist thought. I bought a copy of Milan Women's Bookstore Collective publication, Sexual Difference: A Theory of Social-Symbolic Practice (Theories of Representation and Difference) for 15 euros. When doing background reading for In Search of Elena Ferrrante, I read everything I could get my hands on about Italian feminist thought that had been translated into English. I came across this title but the price was crazy, not unusual for out of print academic books. I’m very happy to finally have an affordable English language copy and will soon post a review.